A late goal four minutes into stoppage time seemed to give Brentford a 3-2 victory over Brighton & Hove Albion this afternoon but then Hemed equalized 7 minutes into stoppage time this afternoon as Brighton salvaged a 3-3 draw. But Newcastle stay 1 point ahead of the second placed team at the top of the Championship table. That was a close escape for Brighton to equalize so late in the game but it leaves Newcastle clear on top of the league. And having had the best defensive record in the Championship they have conceded six goals in their last two games, after losing 3-1 at Huddersfield on Thursday night. Brentford were 2-0 up at half time through goals from Peleteiro Ramallo (15) and Dean (22), but then Brighton came back with second half goals from March (75) and Duffy (78), before the stoppage time theatrics. After only conceding 15 goals in their first 27 games they have conceded six goals in their last two games and have conceded one more than Newcastle this season. Derby have conceded the least with 22 goals – one less than Newcastle. Brighton did well to get a point this afternoon. Brighton at home to Burton next Saturday. Maybe Rafa needs to get Hoots back as his Mr Motivator! Why can’t we fight back like they do? But, let’s hope recent events have galvanised the lads into playing to win until the final whistle’s been blown. 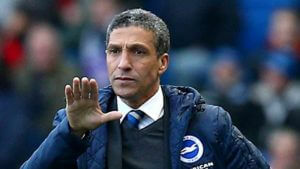 We had a fabulous run (8/8) which ended, Brighton had a fabulous run which has now ended, result: NUFC top. Hurrah! Extremely harsh I know, but I think if Leicester don’t sack the manager they’re getting relegated. Could see both Swansea and Hull staying up the way it’s going at the moment. I never understood why we were unable to sign Knockaert when we had a stab at him in August. We can, certainly, pay him more money, and we can certainly afford to pay Brighton what they wanted (was it £15m?) so I was puzzled. He’s worth having, that’s for sure. Anything below Boro is the midlands?? Leicester to sack their manager? Take more water with it, pal. Three points for Brighton next week and we can only hope our lads get the same from Wulveramton! Swans were unlucky today, been a good week overall. It’s true and it’s incredible.Jamie Vardie: how can anybody explain last season and then this season? Apparently Ranieri has not only lost the dressing room but his coaches are also a bit miffed. There was a game earlier this season where the players didn’t even know what formation they were playing two hours prior to kick off. And Ranieri has allegedly distanced himself from his coaches since their nosedive. I’ll be surprised if he’s there at the end of the season. Losing Kante to Chelsea really messed up the shape of the team. It’s obvious time has caught up with Huth and Morgan. Last season should have been their last hurrah and swansong. Too much loyalty will cost Ranieri. I know they lost Kante but have not replaced him at all. Being the gent he is I was kind of hoping CR would walk away at the top after last season. Can’t believe the brighton result, when brentford scored in the 5th minute of injury time I did a Ross Barkley and went and walked the dogs, only to then come back to that !!!! Belfast. If Leicester’s still in the Champs League I can’t see them bladdering Ranieri. Lesh, have you forgotten the Norwich game already? We fought back to win that one, not draw. Brentford missed a penalty apparently,so Brighton were lucky to get anything. ANYWAY, after all the moaning, whining, whinging and crying, the weekend finishes with us top of the table by a point and superior goal difference. I notice the lack of input from those who love it when things go wrong. ‘Who are ya, who are ya, who are Ya?!!! 🙂 Nothing to say about a good set of results? Or do they only bother when they see something to have a dig about? Belfast. If Leicester’s still in the Champs League I can’t see them bladdering Ranieri. Unless they bring Mancini in to steady the ship. Leicester look a relegated side at the minute….nowt about them. I bow to your superior memory sir. I must’ve lost another million brain cells this weekend! True though, seriously. The landscape changes rapidly, it’s amazing what a few results here and there can do to the overall picture. Bloody hell Lesh have you forgot already our comeback v Norwich? That was a match in this season I will never forget! (We won 4-3 by the way)! This blog has become a moaners paradise what with Ed’s fake news and negativity. What do they have to do to please some people? Moonraker – even if we win the league the moaners will say it wasn’t by enough points or that we lost too many games. Some people feel the need to crap on anything that’s good sometimes, such is life. Certain people are conspicuous by their absence, but that’ll happen when we win and other results go our way. They’ll be back if we have another dip! Isn’t Hoots’ record of Wins/Draws/Losses exactly the same as with NUFC in the Championship?